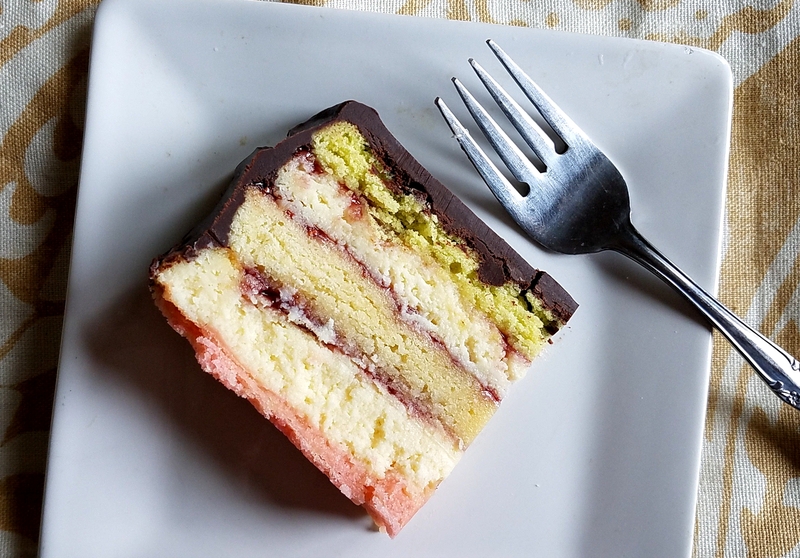 We love Italian Rainbow Cookies at our house and my son loves cheesecake. 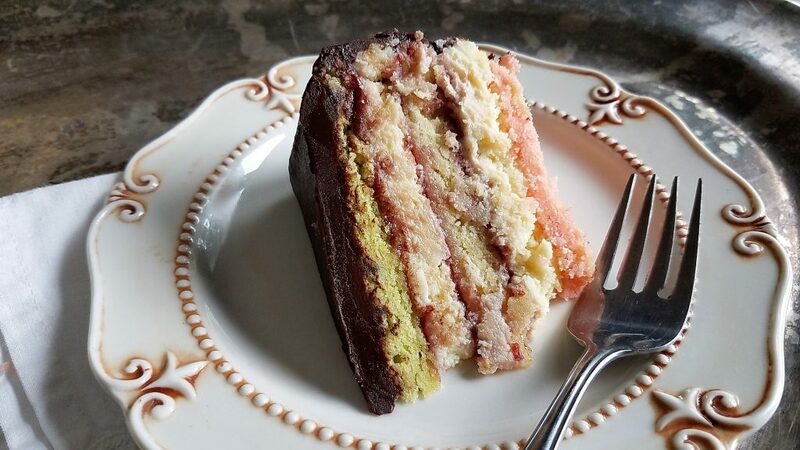 Headed to breakfast the other morning, I was talking about recipes and the idea of a cake that combined the rainbow cookies and cheesecake sounded like a good idea. It’s probably been done before – but I wanted to share with you what I did. 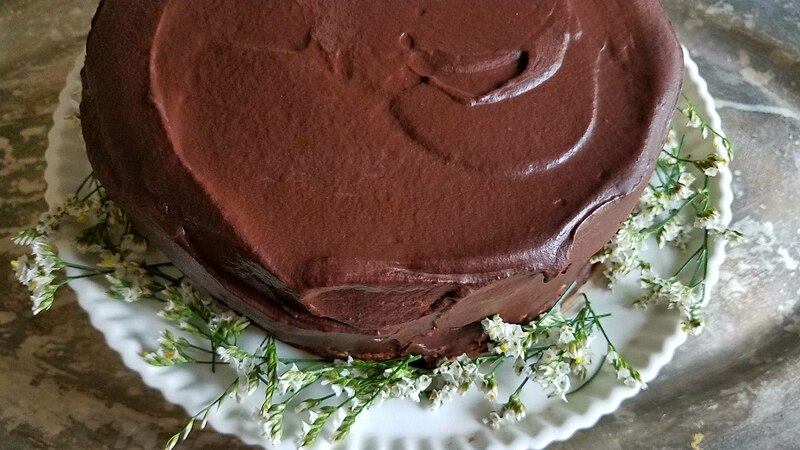 I received many raves about this recipe and had to deliver slices to neighbors, friends and family to keep us from eating it all – even my husband who dislikes cheesecake loved it. Here is how I did it – it was a little work but well worth the effort – more waiting time for cooling than actually hands on. For the rainbow cookie layers – I took my favorite rainbow cookie recipe from Epicurious and halved it (just about). To make things easier – I bought disposable foil cake pans so that I could peel the cookie layers out if I needed to. You can totally use regular baking pans or springform pans and sadly I have enough of those to do that – but all the extras are packed at the present time. Prep three 8 inch disposable pans with non-stick baking spray. Preheat oven to 350 and gather your ingredients – make sure you have taken your butter and cream cheese out way in advance so that they come to true room temperature. This makes for easier mixing. Preheat oven to 350° Put egg whites in bowl of a stand mixer fitted with a whisk; beat until soft peaks form. Slowly add 1/3 cup sugar, beating until stiff peaks form. Transfer to a large bowl; cover; chill. Using the paddle attachment, beat almond paste and remaining sugar on medium-low until incorporated, 4-5 minutes. Increase speed to medium-high; gradually add butter. Beat until fluffy. Beat in yolks, then flour and salt. Fold in whites in 2 additions. Divide batter evenly among 3 bowls. Mix red coloring into 1 bowl and green coloring into second bowl; leave third bowl plain. Spread 1 bowl of batter into each prepared pan; smooth tops. Bake, rotating pans halfway through, until just set, 9-11 minutes. Let cool in pans. Prep with non-stick baking spray – two 8 inch round disposable pans. Beat cheeses and sugar until smooth. Add eggs one at a time, beat — add flavorings or extracts — beat for a few minutes until creamy and combined. Spread filling evenly into two pans. Bake for 35 to 45 minutes on center rack. Allow to thoroughly cool. After all the layers are cooled. 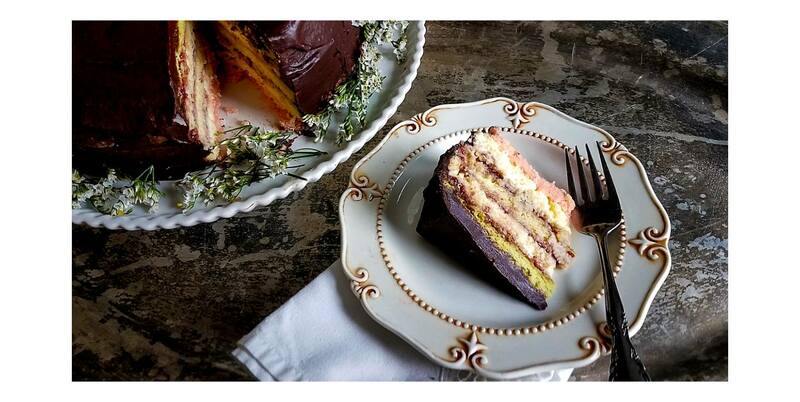 On your cake plate – place the red layer on the bottom. Take one jar of raspberry jam – I don’t heat it or strain it – just spread a nice thin layer on top of the red layer (mine is pink because I don’t like the bright red or green colors). Carefully remove one of the cheesecake layers and place it on top of the raspberry covered red layer. Repeat with a thin layer of raspberry jam on the cheesecake. Take the plain layer of rainbow cookie and repeat, followed by the other cheesecake layer, and ending up with the green layer on top. You will have raspberry jam on each layer. Place the cake in the refrigerator for at least an hour. Ten minutes before taking the cake out of the fridge – heat about 4 ounces of heavy cream in a sauce pan. Place a 12 ounce bag of bittersweet chocolate morsels in a bowl. Pour hot cream over morsels and stir until melted and glossy. I found this amount perfect to cover the whole cake and was relatively spreadable but still gave that hardened snap that rainbow cookies have. Allow the chocolate covering to cool for a few minutes then remove cake from fridge and cover with the chocolate. Return to fridge at least a few hours or overnight. To cut and serve – heat a sharp knife under hot running water and dry to cut pretty slices and put on your eating pants. Enjoy. 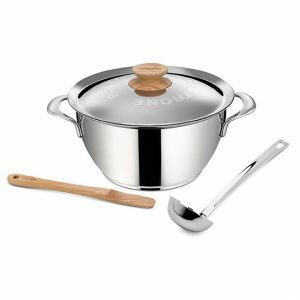 I have a new crush – Lagostina cookware – just when I’m downsizing my kitchen gear – I have fallen hard. Lagostina makes a quality product that is also stunning and they warranty their products for life. Recently, a friend Karen posted that she bought the polenta pot and for one second I told myself to look away – but I am weak when it comes to quality cookware. Lagostina’s polenta and minestrone pot is a thing of beauty as are all their cookware. I am also quite fond of her cousin, the Risotto pot which is just as lovely. And while I love these beautiful stainless steel pots with the wooden accents – the hammered copper – has me contemplating selling a kidney to get the set. I can hold off harvesting the kidney for a few weeks as my friend, Bryna, sent me a set of the frying pans and they are not only gorgeous but they clean up so easily and are now my go to skillets – even over my high quality nonstick skillets. I find myself also reaching for this polenta pot for pasta and other tasks because I keep it out on the stove as it is too pretty to be put behind closed doors. The polenta pot also comes with a beautifully crafted polenta stirrer and ladle. I must be living right because this week, when I took some donations to the thrift store and went in – guess what was there on the shelf – a Lagostina stainless steel pan and lid. I grabbed that $10 deal quickly. That new skillet is to the left of the polenta pot on the stove – in the picture shown. Move over All-Clad – Lagostina has stolen my heart. Even though I have been using this pot for other tasks, I had yet to make polenta in it. 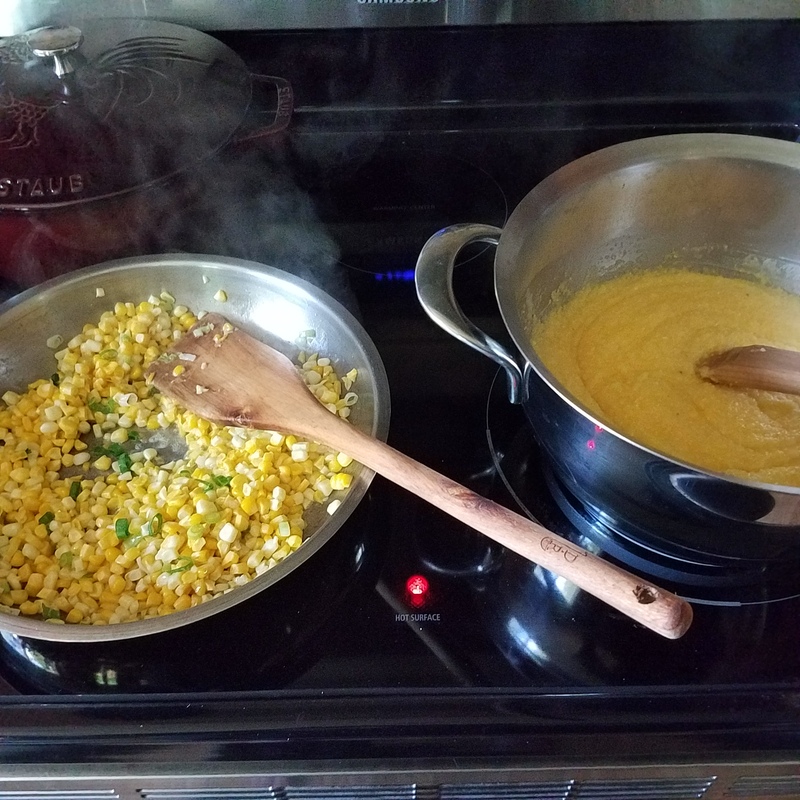 Yesterday, I remedied that and made a luscious Sweet Corn and Scallion polenta. 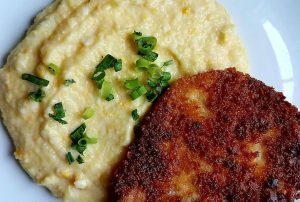 I’ve made polenta a few times before but did some research before diving into my own recipe. One trick I gathered for reducing the cooking time is to soak your polenta overnight – see more about that at Serious Eats. 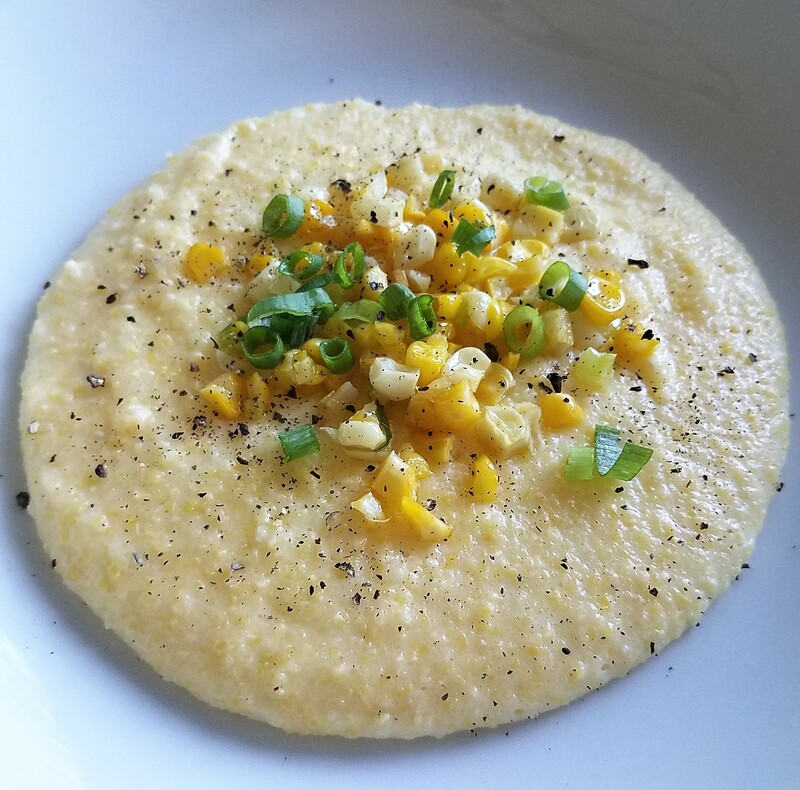 This Sweet Corn and Scallion Polenta that I made for you is so flavorful and delicious and goes well with any protein or as an entree by itself. I did things a little differently than normal polenta recipes – you will see that below in the instructions. For later to rehydrate if you need to do so (see Cooks Illustrated article below). Cut the corn from the cobs and set the kernels aside. Fill the polenta pot with five cups of water and add your cobs to make a corn broth to use instead of water. While that is working make your corn topping. In a skillet, add the olive oil over medium heat. Add the minced garlic to the warm oil until fragrant, then add the sliced white and light green portions of the scallions to the pan, cook for a few minutes – and add the kernels of the corn – stir together and add salt and pepper. Cook for 10 to 12 minutes – and set aside. After the water has come to a bowl with the corn cobs, let it simmer for thirty minutes. Remove the cobs and while the water is still simmering – slowly add the 2 cups of polenta – whisking all the while. I let this simmer and bubble for about 20 minutes before I added 1 cup of whole milk. After 20 additional minutes, I added the four tablespoons of butter and then let it simmer for about 10 to 15 more minutes until creamy. I added about half the corn mixture to the polenta at this point and saved the remaining corn mixture for topping. You can add more black pepper and even some grated cheese if that is something you would like. Check out this article on Cooks Illustrated on how to bring your polenta back to life – to the left is a quick photo of the polenta once I followed the instructions at CI. That is a panko-cheddar crusted pork chop that I served with it. Adelina Pulford started cooking for her family as a seven year old child in the small Calabrian town of Cervicati in Italy. Her family moved to Australia where she entered culinary school and specialized in regional Italian cuisine and desserts. Today, she teaches Italian cooking at her cooking school, “Adelina’s Kitchen Dromana.” Adelina’s Facebook page shares photographs of all the lovely creations that result from her classes – these classes are on my must do if ever we get to Australia. Adelina is the author of three lovely cookbooks which I will tell you a bit about today. 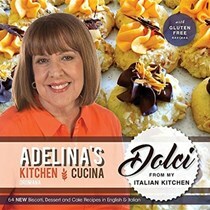 Adelina’s Kitchen Dromana: Dolci from my Italian Kitchen by Adelina Pulford shares 64 recipes for biscotti, desserts and cakes both in English and Italian along with many photographs of the finished desserts. I love Italian baking and books devoted to same. There is something uniquely special about Italian desserts – simple or elegant – even the easiest of cookies look and taste incredible. I think it coincides with the style of Italian cooking. Italians cook with fresh ingredients, dishes are not overly complicated – but always delicious. Almond & Chocolate Easter Eggs, Limocello Biscuits, and a Bavarese with Mascarpone & Chocolate that will wow any pastry chef are included in this title along with gluten-free recipes. I have to admit – I have many Italian baking books and I was worried that this title wouldn’t be a keeper but it will survive MY BIG FAT COOKBOOK PURGE of 2017. 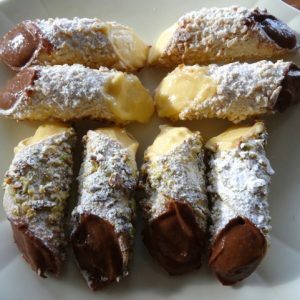 Adelina’s Kitchen Dromana: Learn Cook Enjoy is another title devoted to desserts with 52 biscotti, dessert and cake recipes again in both English and Italian. Pine Nut Biscuits, Vanilla Biscuits with Coffee Glaze, Blueberry and Lemon Friands, and Prosecco Panna Cotta are included in this title. While everything is tempting in this title (as with Dolci above) – the Cake Chapter shines with recipes for a decadent Hazelnut & Chocolate Torte, a Panettone Cake, and a Zuppa Inglese. I just received a friand pan (finally) from Australia and I will be making the friands and will come back to this post to edit. Another must have from Adelina. 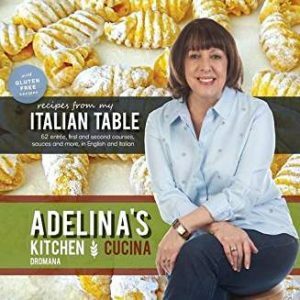 The last book I am sharing with you today is Adelina’s Kitchen Dromana: Recipes from My Italian Table which shares 62 entree, first and second courses, sauces and more – and yes in English and Italian. All the classic traditional recipes are here – Potato Gnocchi, Eggplant Involtini, Chicken Scaloppine Parmigiana, Risotto Calabrese and more. Photographs are plentiful and again includes gluten-free recipes. 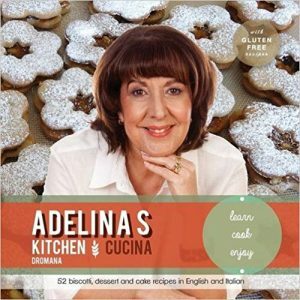 Adelina’s books are approachable and will be appreciated by any level of baker or cook. 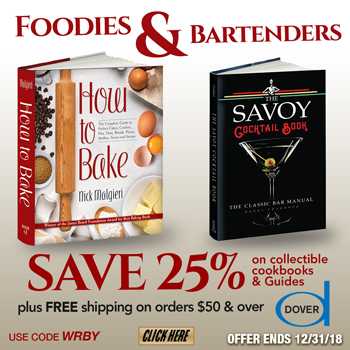 This collection of books would make a wonderful gift for the cook that wants to expand their knowledge of Italian desserts and get started on the savor classics. Her books are simple and straightforward but unique enough to please this Cookbook Junkie. Adelina is sharing a recipe with us today – her Baked Cannoli in both Italian and English. You can download the file here as well. Mix ricotta in a bowl with liqueur, icing sugar, the fold in whipped cream; refrigerate before using. 4 cucchiaia di zucchero a velo. Adelina is generously offering one reader a set of her books. This contest is open until June 12th to US and Canada addresses. To enter please use the Rafflecopter widget below. There are many extra entries available – such as joining Eat Your Books, sharing this post and so forth. Good luck! New readers from Adelina’s Facebook page – please note that you can try Eat Your Books for 3 months using the code CBJ17.